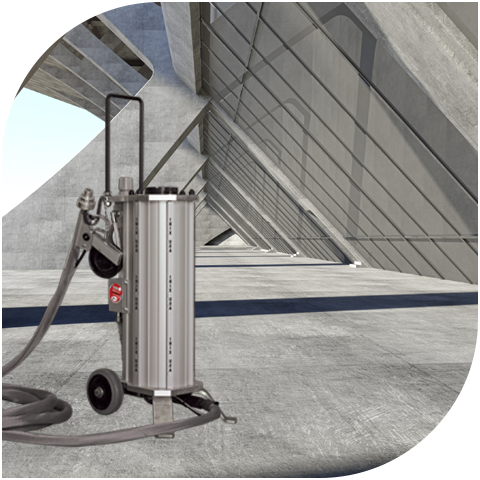 IBIX® lightweight, portable aluminum surface blasting systems feature a low-pressure micro-air abrasion system perfect for cleaning and restoring corroded factory flooring, concrete bridges, steel industrial buildings, airports, malls, parking garages, chemical environments, water plants and much more. Some examples of materials that can be cleaned and restored are concrete, masonry, stone, steel, aluminum, stainless steel, wood, glass, marble and composite materials. IBIX units are portable enough for one-man operation, come equipped with rollers for easy portability and deliver a precise, consistent, air and media flow for a smooth surface finish every time. Minimal dusting improves the health and safety of the operator and the environment. The Spartacus is a lightweight, portable and versatile system ideal for coating all types of infrastructure including structural steel, pipelines and concrete. Coatings applied with Spartacus provide a smooth flexible finish that is resistant to chemicals, salt, chipping, cracking, scratching and harsh environments. UV stable for outdoor applications, Spartacus durable coatings cure in seconds and are exceptionally beneficial for substrates that are susceptible to acid, sulfates, corrosion and chemicals.